Product #17388 | SKU SF8UX | 0.0 (no ratings yet) Thanks for your rating! 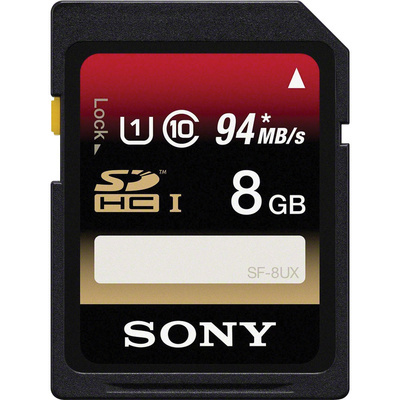 The UHS speed class 1 certified 8GB UHS-I SDHC Memory Card from Sony features a maximum read speed of 94MB/s and a maximum write speed of 45MB/s with minimum transfer rates of 10MB/s. It is water / dust / X-ray proof, resistant to UV light rays, magnets and static, and capable of withstanding extreme temperatures. Downloadable File Rescue software helps recover photos and videos, including 3D and RAW files, that have been accidentally damaged or deleted.